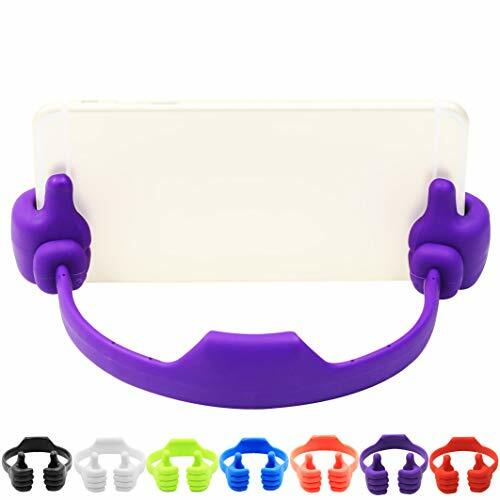 7Pack Thumbs-up Cell Phone Stand, Honsky Universal Flexible Multi-angle Cute Desk Desktop Phone Holder, Compatible with iPhone iPad Samsung Android Switch Nintendo Tablet, Assorted Colors, Bundle by Honsky at DJ Luu. MPN: 3222767. Hurry! Limited time offer. Offer valid only while supplies last. NOTES Thickness of device in case: NO more than 3/8 inch (10mm) Only vertical mode is for tablets larger than 7.9 inch, such as iPad, iPad air. Only vertical mode is for tablets larger than 7.9 inch, such as iPad, iPad air. br> Wow!!! Had to say, the cellphone stand is adorable & fun thumbs up design. Still be skeptical about its practice? Save time, just buy it!!! You will be surprised in its function and lovely design!!!
. Buy one in kitchen to look at recipe when cooking.
. Buy one to take out in bag to for reading at lunchtime, airplane or coffee shop.
. Buy one as a gift for your teenagers, parents, girlfriend, co-workers, sisters, and brothers as stocking stuffer. 3. Pretty, fashion & youth feel. 4. High-quality TPU, sturdy & flexible. 6. Easy use, simply insert your device in between two thumbs. 7. Recyclable material, eco- friendly. If you have any questions about this product by Honsky, contact us by completing and submitting the form below. If you are looking for a specif part number, please include it with your message.